Having now finished Solar, and the Walter Kirn review in Sunday's New York Times, I've made two decisions; I must read more Ian McEwan, and I must never read another review by Walter Kirn. Not only are his opinions about the book wildly off the mark, but he's a plot ruiner extraordinaire. Truly, I'm baffled. Anyhow, I loved the book. The main character is one Michael Beard, Nobel Prize winner in physics and now, 20 years and 5 marriages later, an accidental climate scientist. The delicious fun of the book is that Beard is so comically appalling. His womanizing, his over-eating, his cynicism...everything makes him abominable, but somehow not despicable. The book is about his misadventures in love, green technology, crime and punishment, overeating, overdrinking. This is the sort of closely observed dark comedy I just love. Stop reading now if you haven't read the book and plan to, because I've got to say something about the last two pages. Not so satisfying. It's not just that the plot goes awry, but the novel winds up saying the wrong thing. Unless you are determined to hear no message at all, the book seems to say that personal self-control is key to getting global warming under control. 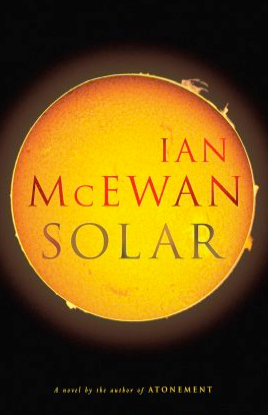 McEwan won't let his gluttonous, thoughtless, amoral "hero" pull off a technological feat that could save the world. Why not? Bad people don't do good things? But they do! Maybe we're supposed to take this a little more metaphorically. OK, green technology geniuses can be slobs and womanizers. What he's trying to say is that we have to get our appetites under control, if we're going to solve the problem of global warming. Is Michael Beard us? I'm afraid that just doesn't work. He's much too abominable for that. And the appetites theory of our environmental crisis doesn't seem very insightful anyway. We're not really, as individuals, "too" greedy. There are just too many of us, so our collective ecological footprint is too big. It's not because of greed that our cars produce greenhouse gases--they just do, because of the sort of cars and fuel we use. Solar needed another ending--more "organic," less punitive, less message-y. I want to know what really happened in the end (come on, what about Darlene and Melissa?) not what had to happen to teach us all about the hazards of over-consumption. Other that--a really enjoyable book, and interesting too. You say that "we, as individuals, are not too greedy". I assume that you lead a reasonably green lifestyle, but some people definitely are "too greedy". There are people with huge cars that they don't need, with huge, overheated houses, with private jets, with flood-lights on their lawns at night, who use fossil-fuel burning machines for the simplest and easiest home chores. It's not just "some people" Amos. Almost all of us live a lifestyle dictated by greed rather than need. Most of us are driving bigger cars than we really need, and driving them unnecessarily. Almost all of us live in bigger houses than we actually need, full of energy guzzling appliances. Many of us buy new toys every time a flashier cell phone or lap top comes on the market. We buy a new car before we need it, eat a half pound of meat a day, use shopping as a form of entertainment, buy all kinds of stuff (from shoes to electronics) that we end up not using more than once or twice, eat out several times a week, and use fossil fuel burning machines in preference to a little healthy activity around the house. We have greedy appetites for luxury. Hi Ed: You should talk to my sister. She refuses to use the dishwashing machine, to put on the heat in the house until it's below freezing, to let the water in the shower get "hot", to buy paper towels, to use plastic bags, etc, etc. You and she are most likely right. Amos, Thanks a lot. That matches my perceptions of the book perfectly, 100%. The food descriptions are priceless, all very funny in an offbeat way. A "shaggy hog story"....HA! I've read several reviews of the book, and they all seem to refer to that "two men and one bag of crisps on a train" comic scene. It looks like McEwan stole that scene from the late, great Douglas Adams, who frequently told the same tale about his own adventures in a train station with a complete stranger and a package of cookies. That scene is really really funny, and credit is given where credit is due. About whether we are greedy...I am not sure what to say about that. Most people unconsciously assimilate the lifestyle around them. Is it really greed? Does it help anything to say it's greed? Maybe it's better just to say "this level of consumption has such and such harmful effects," and leave it at that. The focus on virtue has some untoward consequences. People dismiss Al Gore because he lives in a big house. They get obsessed with things like climategate (the little email incident) because it involves something they can understand--a personal matter of virtue and vice. I'm not sure we need to get puritanical and anti-materialistic in order to effectively address climate change. No, it doesn't help to call people greedy (it offends people unnecessarily), but some people are greedy. We're not in 1955. There are lots of alternative life-styles around these days; there is a lot of information available about the environment and about global warming. If someone opts to ignore that information, then that person is greedy or selfish or does not care about what will happen to his children or what is happening in countries like Bolivia right now, with glaciars melting. Now, I think that you're right: it doesn't help the cause of global warming to call people names, even if they deserve to be called names.